We are very excited to announce a new addition to our Boulder team! Originally from Iceland, Heimir Sverrisson has worked in various technology fields, including architecture design for highly distributed systems, higher education, and database systems for financial, transportation and telecommunications companies. Heimir is so interested in distributed systems that even his children are spread out over nine time zones. In his free time he is building a small autonomous robot using Raspberry Pi and Arduino and is currently training it to understand spoken commands, in Icelandic. 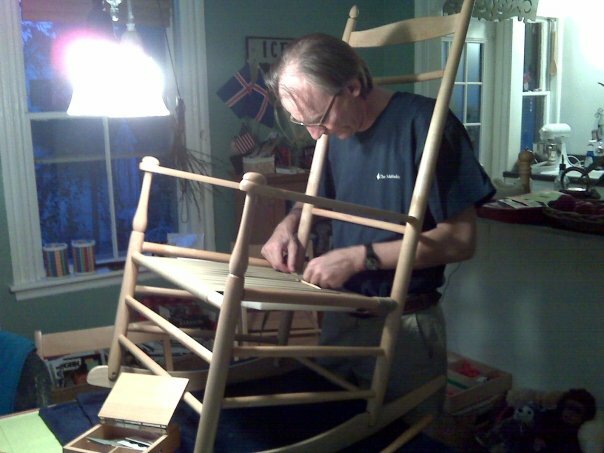 As if building a robot wasn't enough, he also builds rocking chairs. We asked Heimir a few questions to help get to know him better. I got my undergraduate degree in EE in Iceland, where I’m originally from, followed by my Masters in EE at the Technical University of Denmark. Since then I’ve worked in various industries in Iceland, Denmark, UK and here in the USA. I started out in Electronic Engineering but soon began to write Operating System code, Device Drivers etc. This was followed by designing and building technical computer systems using Relational Databases and Networking. I’ve mostly been working in small companies and startups and had my own business for five years. I’ve built systems in many different sectors including banking, telcos, energy and medical. One of the more interesting projects was a Distributed Real-time Fish Auctioning system that I designed and built a long time ago. The Real-time requirements, down to milliseconds were not easy to meet in a system using IP protocols on top of dial-up lines! What I enjoy the most about engineering is getting to tackle really hard problems. The downside is to know that for each problem you solve you’ll get at least two more. The ability to communicate is extremely important if you want to be a successful engineer. I’ve said that my job is 80% communications and 20% technology. I don’t know so much about other jobs, but what really gets me going is to contribute to building systems that get used to ease the work or life of somebody else. One time when working on EEG (brainwaves), I found out that by converting the electric potential (scalar field) into electric current (vector field), the diagnosis of epilepsy in infants would be made more reliable. Getting to know all these interesting employees. As a member of ACM, I try to keep up with new things through their publications. This includes some some interesting recent webinars by Bertrand Meyer called “Agile! : The Good, the Hype, and the Ugly” and Mike Stonebraker, the winner of the Turing Award 2014, on specialization of data stores. A water heater to brew tea! Fuel cells to generate electricity as the energy density of batteries is still much to low. To be a part of a cohesive family.